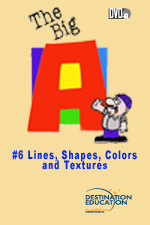 The elements of design are introduced as Don leads the children in The Big A Finder Game. A colorfully renovated gas plant provides an exciting setting for the children to find and identify large scale lines, shapes, colors and textures. Don and the children decide to beautify a defaced tank at the park by painting a mural on it using the lines, shapes, colors and textures they have collected in their Idea Books. Rights granted with the purchase of DVD or VHS include: a) life of media audiovisual use, b) public performance, c) campus or building closed circuit and digital/video-on-demand transmission. The episodes may also be licensed for broadcast or cablecast. Contact slenzen@shopdei.com for details.